Start where you are. Do just one minute. Set a goal. Create accountability. Etcetera, etcetera, etcetera. You’ve read all the tips on how to create a new habit, or lead a better life, but why is it that you always feel like you aren’t quite getting it or it just won’t stick. You read books and search for new techniques to stick to your exercise program or your home maintenance schedule or your bujo journal, yet it still fails you. You start and you are doing great. Then life happens and throws you off course. You feel like you are back at the beginning and it’s hard to get started again. What if I told you that you are doing everything right? What if I told you that this is the model? We aren’t going to get it right. It is about starting over and trying again. It is about finding a new way, a new technique, or a new plan all together. You’ve heard the saying; Life is a journey not a destination. Why do we apply this only to the big picture and not to those little moments of struggle? You know “the dash on your tombstone where it all happens”. Don’t for one minute think that because you aren’t getting it right you aren’t living well. You are! And you are strengthening your resolve. You are doing a great job because it’s in those moments where we fall off the wagon where we can make new decisions and have the space to grow and change. Each time we re-start we are building that resilience muscle and let’s face it that may be the most important muscle in our entire body! This realization came to me through my meditation practice. I have been terrible at keeping my practice. I haven’t been able to go to my weekly class in almost 2 months and that is the anchor for me. That is something I have committed to in order to keep a foot in the door and not give it up entirely. What I hadn’t realized is that I surround myself with things I want to explore and learn more about. The podcasts I listen to, the books I read, the groups or activities I join, they are my safety net. They keep me where I want to be. These were the by-products of many new beginnings. They came to being because of my habits not sticking. So I haven’t been meditating, BUT I listened to a podcast that explained how meditation IS the process of pulling you mind back when it drifts off. I am not doing it wrong because my mind drifted off. For me the practice is always pulling my mind back to observation mode and not thinking mode. This gave me the shift I needed from I “should” be trying to meditate to “I am trying to pull myself back into a practice”. I am strengthening that muscle. I am getting stronger and more resilient because I have more obstacles to overcome. I have set myself up with good people and circumstances for growth and I am doing it all right. I am not perfect. It may feel like a lot of false starts and expressions of how “this time I’ve got it right!” HA! Life IS a journey and we aren’t going to ever arrive. Instead of getting frustrated know that you are a work in progress. You are striving to be better every day and that means you are getting stronger every day. This isn’t to say that you will never achieve a goal, but it will always evolve to more. You will uncover new desires and you will always be flexing this muscle to overcome obstacles, but maybe the accomplishment isn’t the point. Maybe it’s what we learn every day of the journey. I wish for you the clarity to know your heart’s desires and the wisdom to have patience and faith to have trust in the journey. You are a work in progress and that is exactly what we are meant to be. There are moments of realization and understanding that come to us every day. Are you listening? A friend was visiting my house recently during my end of day dinner and activity rush and as if the balancing act of visiting with her while fielding questions from my kids and also trying to get food on the table wasn’t enough, the phone rang. I looked at her and we both laughed and she said, “your house is nuts!” I quickly agreed, but added that I used to have to remind myself to breathe at the end of the day because the pace was so fast that I would literally forget to breathe. Now that my post-cancer life has once again returned to this active pace with the five of us sometimes going in different directions, things are just as busy as before, but I don't ever forget to breathe. This doesn’t feel like that place of serenity and calm that I was shooting for, but you know what? This is real life and I think that remembering to breathe is a huge accomplishment. The tools I’ve been creating and surrounding myself with opportunities to slow down or reminding myself to pause for a sunset or to take 5 extra minutes before I rush out the door in the morning has created this space for me to breathe every day. It’s not always at the same time and it’s not something planned or scheduled, but the practice has ensured that it just happens organically. In diets we all understand the difference between a diet and a lifestyle change. A mindfulness shift is very similar. It’s when you practice and practice and then one day you realize it has become a part of you. You no longer have to work so hard because you do it naturally. Now, I don’t know that anyone can really fully arrive at a place of pure serenity. There is always a deeper connection you can strive for, but knowing what connection you are trying to make and recognizing progress means you are already reaping the benefits of your mindfulness practice. In a class I attend it was noted that a practice is something we need to do every day. At first this sounded pretty intimidating. Much like exercising every day is a hard commitment to make even though we enjoy how we feel afterwards and we want to experience all the benefits of such a practice. I asked myself, “Can I really take on another thing that I have to do every day? !” Well that right there is the answer. NO. I say no because mindfulness shouldn’t be something we HAVE to do. In fact, it is something that just happens. We are aware of our surroundings. We are aware of the temperature or the feelings of a friend who is going through a difficult time. We are aware of our to-do list and our social commitments. Mindfulness is something we do every day so it is not something we need to create. It is not a big chore that we need to check off on our list. It’s a state of being. We can choose that state of being and continue to work towards a place that makes us feel happy and whole and of course grounded in our beliefs. With this in mind an everyday practice would look different for everyone. There is no road map. There is no magic number of minutes to meditate. There is no book that will give you the answers and so on. Everything you need to know resides within you. The answers are for you to uncover. Every day we can live with the intention of learning mindfulness to allow us to experience peace and forgiveness, love and joy, and all the other beautiful things that should be a part of our existence. If you are reading this than you are already open to exploring these parts of yourself. Stay curious. Continue seeking and surrounding yourself with positive energy whether you find it in your family rituals, in a yoga class, during meditation, at a church service, with a friend or in all of these place or any where else you may find it. Continue seeking out these places and people and beliefs that bring you peace and make you feel grounded and whole. 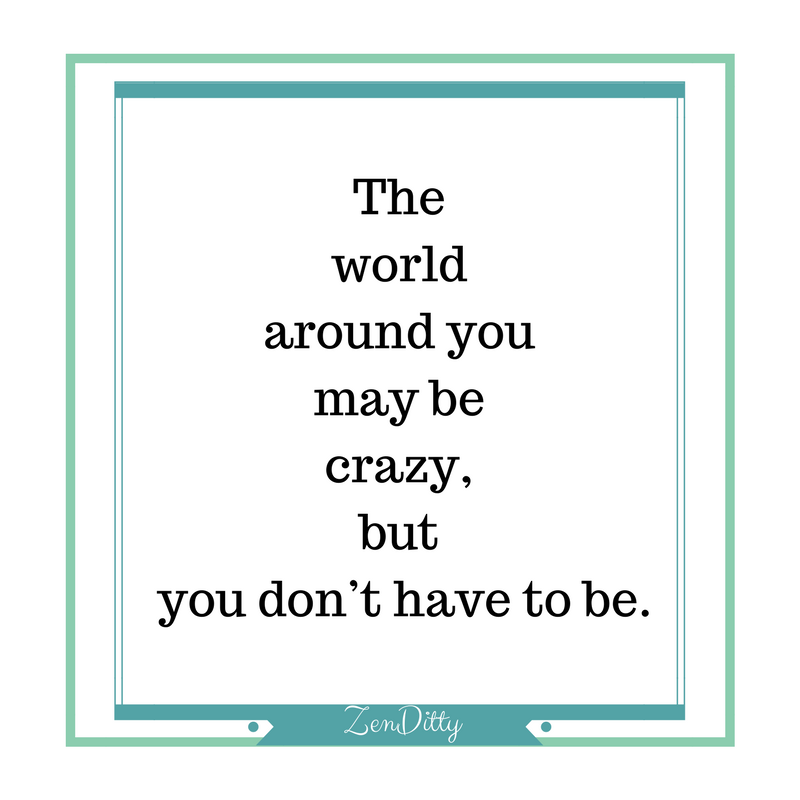 The world around you may be crazy, but you don’t have to be. I did a guided meditation this morning on gratitude. Somewhere near the middle the voice told us to be grateful for our inner child and to send love to our inner child. At this point I began to cry. I didn’t think I was that connected to the style meditation I was listening to, but he obviously hit a nerve. My inner child was crying for love and support. That poor child always has to take the backseat, speak only when spoken too and all of that. Real children have a way of getting noticed. They get our attention to show us they know how to do a cartwheel or they got an A on a homework assignment. They ask for our praise if they aren’t receiving enough and they ask for our love and attention when they need or want it. As we grow this child learns to be more reserved, to need less praise and love everyday because adults have responsibilities and there are expectations. Most of us have joked at one point in time about our husband wanting a gold star for emptying the dishwasher or making the bed or some other chore we see as ordinary and not worthy of appreciation. This is their inner child speaking out and asking to be fed. Maybe we all need some more celebrating! When I used to think about nurturing my inner child I thought about swinging on the swingset with my kids, creating or singing at the top of my lungs and maybe even doing a silly little dance step. Simply playing. But I never thought to tell my inner child that I love her. I never thought to say to her, I know it’s been a long day and you’re tired. It’s ok to cry. It’s ok to be a little selfish for a while. You have healing to do and you need this time to gather your strength so you can come back out and play with us. I think it’s time to honor, nurture and love this child within me, but how do I even talk to her? How do I give her a voice? Just starting with acknowledging she is in there can make a huge difference. Thinking of her as a real child that happens to live inside of me can make a huge difference. Journaling the words you need to hear can make a huge difference. Meditating and honoring her accomplishments and sending her love can make a huge difference. There are many ways to honor this child, but they all start with acknowledging her. I hope you will take a minute to tune into your heart and ask that child within you how he/she is doing and really listen to the answer. When you have the answer I think you will know what to do with it. We aren’t whole unless we honor all the parts of our being. And just like real children when we are not nurtured the way that we need to be we may act out. We may be sad, get in a fight, or in trouble because that child is in need and is unable to have those needs fulfilled. You wouldn’t dream of neglecting any other child. Why would you neglect your own? “Who is in charge of this?” he said, pointing to his head and looking at me directly in the eyes. OUCH. I think he just nailed it. Who is in charge of my head??? It should be obvious, "I AM", but quite frankly, I don't know who has been steering the ship lately. The kids are home for the summer which means I am less structured, but also busier tending to needs, breaking up fights, rushing off to doctor appointments etc. When there is downtime, my favorite hobby is letting my brain bounce all over the place. My best visual for this is when I go online to look something up, maybe something as mundane as a phone number. Next thing I know I have opened up web pages on summer vacation ideas, recipes to make for dinner, recipes to save for later, project ideas to do with the kids, Facebook and three of my email accounts. So the screen shows all these tabs activated. I only use the computer as a description, because my brain actually has many more tabs activated than the computer. After being "on" all day it feels good to let my brain just drift and wander, but that question WHO IS IN CHARGE OF THIS, hit me hard. I am in charge of it and no matter how good it feels to unwind this way at the end of the day it isn't getting me anywhere. In fact, it is adding to the feeling of chaos because I've just added a million things to my mental list. My goal is a more intentional life and this mindlessness is in direct opposition to my desires. Summertime is a rare opportunity to have this sort of break and down time and I will never have another summer quite like this one. Understanding is the first step to making a change and getting back to my wellness basics will help me strengthen the muscles that help me live more intentionally. I consider my wellness basics to be quite simply mindfulness. Instead of letting my mind wander, I need to strengthen the ability to keep my mind calm. It's strange that it takes more energy to think nothing, but if you have ever tried you know it isn't easy. The thing is that whether you sit in centering prayer or silence just listening to your breathing, the act helps to slow down the chaos of the day. It is hard to see how one act can affect the other, isn't it? How does a few minutes of meditation in the morning make my busy day of appointments any easier? There are many books on this and many explanations, but let's just try seeing how it works for us and maybe the explanation won't really matter. There are many forms of quieting the mind and we'll be exploring them here at ZenDitty in the next few weeks. For now, enjoy your summer, don't change anything, just observe "Who is in Charge?" and check back in to ZenDitty so we can continue to work this muscle and live intentionally and with great joy. *I love this app for meditation or yoga. Think fitbit for meditation and connect with me @ZenDitty! The app is "Insight Timer" available for both Android and IOS.